→2000MY: Check condition and width every 10,000 miles or 12 months, whichever occurs first. →2000MY: Replacement every 40,000 miles. 2001MY→: Replacement every 60,000 miles. Injection pump sprocket locking pin – No.2064. Camshaft setting bar – No.2065A. Check diesel injection pump timing after belt replacement. Turn crankshaft to TDC on No.1 cylinder. Ensure flywheel timing marks aligned  . Fit setting bar No.2065A to rear of camshaft  . Centralise camshaft using feeler gauges. Lock injection pump sprocket  . Use tool No.2064. Slacken tensioner nut  . Turn tensioner anti-clockwise away from belt. Lightly tighten nut. IMPORTANT: Timing belt width must not be less than 21 mm. Ensure flywheel timing marks aligned  . Ensure camshaft setting bar fitted correctly  . Ensure locking pin located correctly in injection pump sprocket  . Slacken camshaft sprocket bolt 1/2 turn  . Loosen sprocket from taper using a drift through hole in timing belt rear cover. Sprocket should turn freely without tilting. 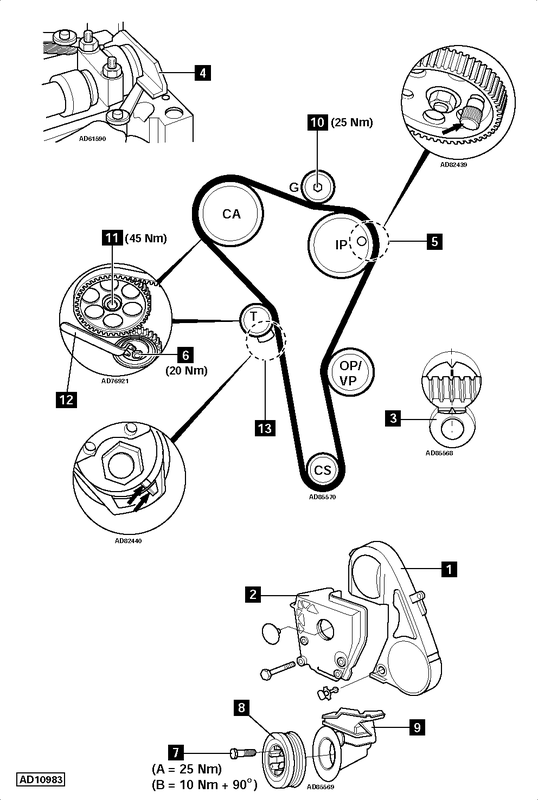 Fit timing belt in anti-clockwise direction, starting at crankshaft sprocket. Ensure belt is taut between sprockets. Remove locking pin from injection pump sprocket  . Fit guide pulley  . Tighten bolt to 25 Nm. Turn automatic tensioner pulley clockwise until notch and raised mark on tensioner aligned  . Use tool No.3387  . Tighten tensioner nut to 20 Nm  . Tighten camshaft sprocket bolt to 45 Nm  . Turn crankshaft two turns clockwise until timing marks aligned  . Ensure camshaft setting bar can be fitted  . Ensure locking pin can be inserted in injection pump sprocket  . Apply firm thumb pressure to belt. Tensioner marks should move out of alignment  . Release thumb pressure from belt. Tensioner marks should realign  . If not: Repeat tensioning procedure. (A) Except Lupo – 25 Nm. (B) Lupo – 10 Nm + 90°.